Colony of Arthrobacter chlorophenolicus, from the United States Department of Energy. Arthrobacter is a widely distributed genus of bacteria, found primarily in soils. 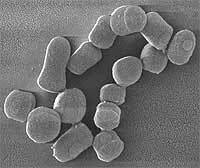 They appear as Gram-negative rods in young cultures and as Gram-positive cocci in mature cultures (Storms et al. 2003). [IJSEM02] IJSEM. 2002. Validation list no. 85: Validation of publication of new names and new combinations previously effectively published outside the IJSEM. International Journal of Systematic and Evolutionary Microbiology 52: 685–690. [SD03] Storms, V., L. A. Devriese, R. Coopman, P. Schumann, F. Vyncke & M. Gillis. 2003. Arthrobacter gandavensis sp. nov., for strains of veterinary origin. International Journal of Systematic and Evolutionary Microbiology 53: 1881–1884.